Denny Jump (Bellevue, WA, United States) on 6 December 2011 in Cityscape & Urban. Here, at the foot of what is known as "The Free Bridge" in Easton, PA, is the assemblage of signs that welcomes people driving or walking westward across the bridge from Phillipsburg, NJ to Easton, PA. The Delaware River serves as the border between the two States. Larry Holmes, the famed former Heavyweight Boxer, hails from Easton and he still lives here. A very popular guy, he owns a restaurant and has a TV show. This conglomeration of signs, along with the red hand (which tells pedestrians NOT to cross the street right now!) struck me as a rather funny combination of messages. Great shot Denny! That is a hard hitting street name too! I hope you and your family are doing great and you get some good time off for the Holidays! Love the juxtaposition you've captured Denny. @Bill Brown: Thanks Bill - it was just something that struck me ;-) All the best! @Gérard Beullac: Thank you so much Gerard..I really love your work!! Great spot Denny, I like the idea of walkers being prevented from entering PA by the red hand. yeah, do NOT cross right now or Larry Holmes will stick ya with that famous jab of his... ha ha : nice one, Denny! Great shot Denny. Long live irony. Happy ST.
@Williams: Absolutely - Thanks so much Paul..loved your shot today! Great street shot, love the signs and the trees in the background that dropped their foliage, well seen. 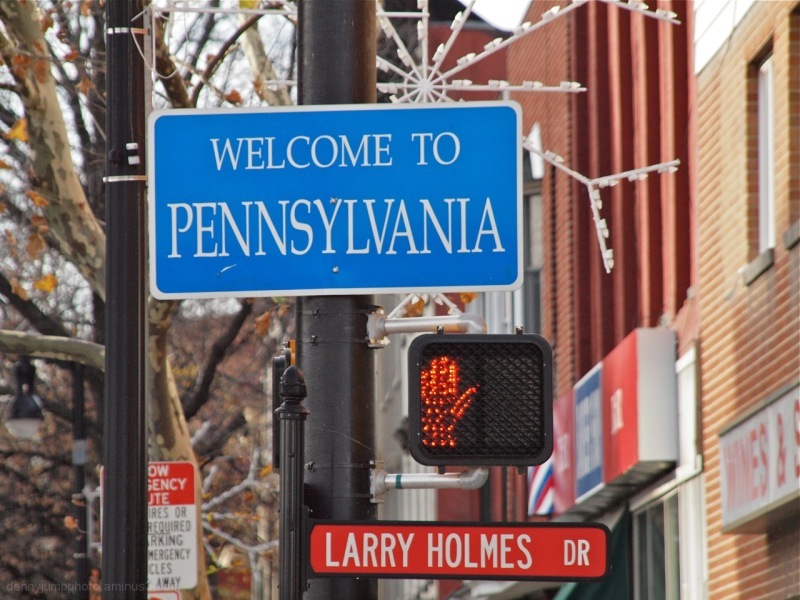 Of course one could read this as "Welcome to Pennsylvania and be sure to stop by Larry Holmes Restaurant." Happy ST! Maybe it's all a sign of the times. Happy Silly Tuesday, Denny. @B. Thomas: Yah, like Mr T. "You better stop, Sucka, before I punch you out...!" Great captured. very nice composition. wonderful framing. well spotted and taken, denny !!! A great capture! Happy ST! Welcome but STOP! Ha, Happy ST, Denny. Great selection. I agree ... an eye-catching combination of signs ... well sighted and captured!